Come for a fun and relaxing evening that'll introduce you to the pottery wheel while you sip your favorite beverage. We'll show you the basics and provide time for you to experiment with various shapes. If you create some things you’d like to keep, we'll fire and glaze them for you to pick up a couple weeks later. So grab your BFF or co-worker and a beverage and enjoy a few hours with the wheel! This is an enjoyable evening and NO experience with the pottery wheel is required. 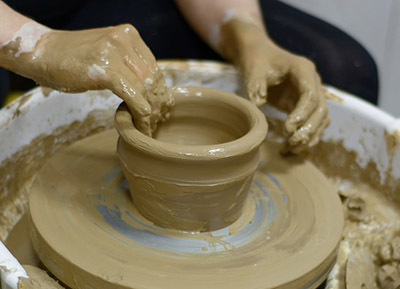 If you’ve ever been curious about creating pots on the wheel, this is your chance to try your hand at it while having fun with friends new and old. Who knows, maybe you’ll discover a new love! If so, we offer five-week introductory wheel classes throughout the year, where you can learn all the basics required to become a clay studio member. Price for each session is $28 plus $8 for supplies and $4 firing fee for each piece you make.